Restaurant Week!!!! I love Restaurant Week. I even did a video about Restaurant Week when I was participating in VEDA. Restaurant Week just ended here in Philly and I got to go on the last day. This was probably like my 20th time. Philadelphia Restaurant Week happens twice a year. I have gone twice a year for many many many years. Why do I go every single time? Because it brings me Joy. I love it for these four reasons. Friends – The company you keep makes all the difference. Lucky for me I keep pretty good company. I have girlfriends from college, childhood, work, blogging, zumba, etc… These ladies are all different but the one thing we all have in common is we have full lives. We work, travel, take care of our families, and pursue our passions. That means we all also don’t have much time. The fact that we have consistently gotten together for restaurant week is awesome. Sometimes there are as many as eight of us for dinner. Other times there are ony three or four of us. Twice a year for the last ten years we’ve managed to coordinate schedules for Restaurant Week. Food – In all of these years I have only hade one bad dinning experience. Honeslty, it was more the service than the food that made that one experience bad. The Restaruants in Center City Philly do not dissapoint. I do not have the most adventurous pallet so I have gone to steak houses and Italian reastaurants more than any other cousine. Ruth’s Chris, The Capital Grill, McCormick And Schmicks, Chima, and The Plough & The Stars have given me very fond and tastey Restaurant Week memories. This time I made our reservation at Mixto . 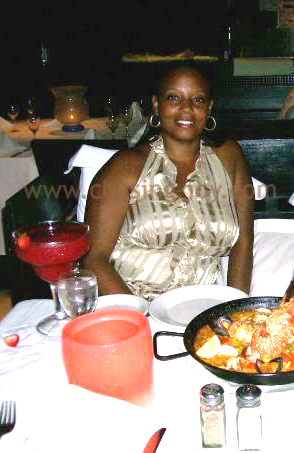 Mixto offers Cuban, Latin American and Caribbean cuisine and it did not dissapoint. I tried Chicken and Beef Empanadas, Paella, Plantains, and Chocolate Cake. I also had two very yummy cocktails (Yay, I wasnt driving!!! LOL ). It was all so good. I’ve never had a bad meal at Reastaurante week. Atmosphere – I do not live in Center City Philadelphia. So usually if I go out to eat it is to a chain restaurant or a dinner in another part of the city. Dinning out in Center City is just a different vibe. It is a fun vibe. An adult vibe. I like it!!! Me Time – Like I mentioned above. All of us ladies who meet up for Philadelphia Restaurant Week have very full lives. A lot of our time is spent doing boring responsible stuff like working, exercising, and taking care of loved ones. It is nice to have these few hours a couple times a year to do something fun. We don’t bring kids, husbands, boyfriends, or parents. We just take time to enjoy oursleves. 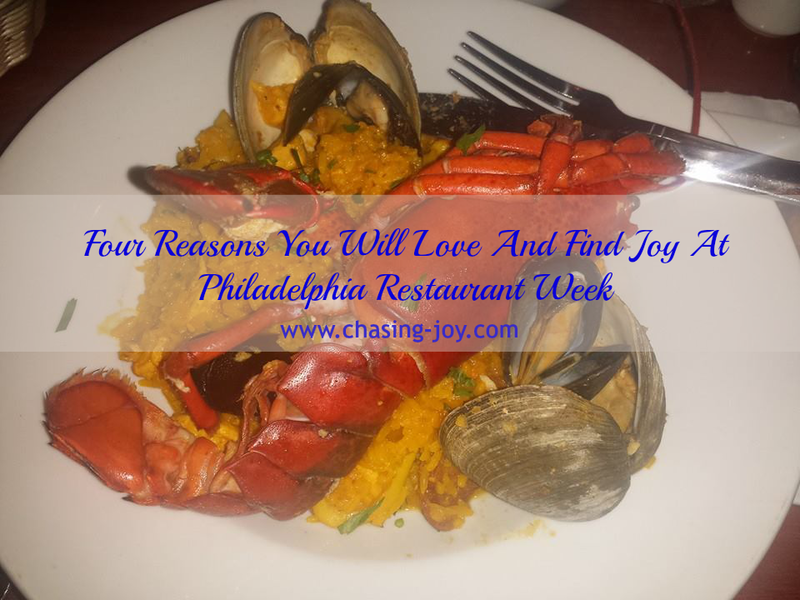 Philadelphia Restaurant Week is awesome and I highly recommend you participate. I know cities other than Philadelphia have restaurante week as well. One year my summer vacation to South Beach happend to be during their Restauant Week. We definitly kicked our vacation dining up a knotch that year. Philadelphia Center City Restaurant Week will probably take place again in the summer. You can book mark the website http://www.centercityphila.org/life/RestaurantWeek.php and follow the @PhilaRestWeek twitter account to know for sure. Something as simple as my routine of going out for restaurant week is a great source of Joy. It makes me happy to look forward to it, the food is good, I reconnect with friends, and the atmoshpere is great. It is important to make time to do things that bring you joy. It is important to connect with friends who give you joy. Philadelphia Restaurant Week allowed me to do both. When was the last time you did something that gave you joy? When was the last time you spent time with friends who give you joy? I love restaurant week! It's a great way to try out new places at a deep discount. I haven't been to restaurant week in years! I really need to get to the one in Atlanta this year! the food is always great! Charlotte has Restaurant Week, and I've never participated in it. It looks like you had tons of fun in Philadelphia! I love restaurant weeks! I always somehow miss the ones in Atlanta. The food looks amazing. I wanted to gobble up that lobster. I love eating some finding good eats is my thing. I'm a fan on restaurant week, it is a great way to check out new places. It is also a great way to check out pricey places with a deep discount.